A couple of weeks ago I received an email from Look Fantastic offering an extra 20% off sale prices for the first 200 customers who used the code SALE20. Although I really shouldn't have I decided to have a browse through the sale as the one sale purchase I had made I returned because I wasn't happy with it. 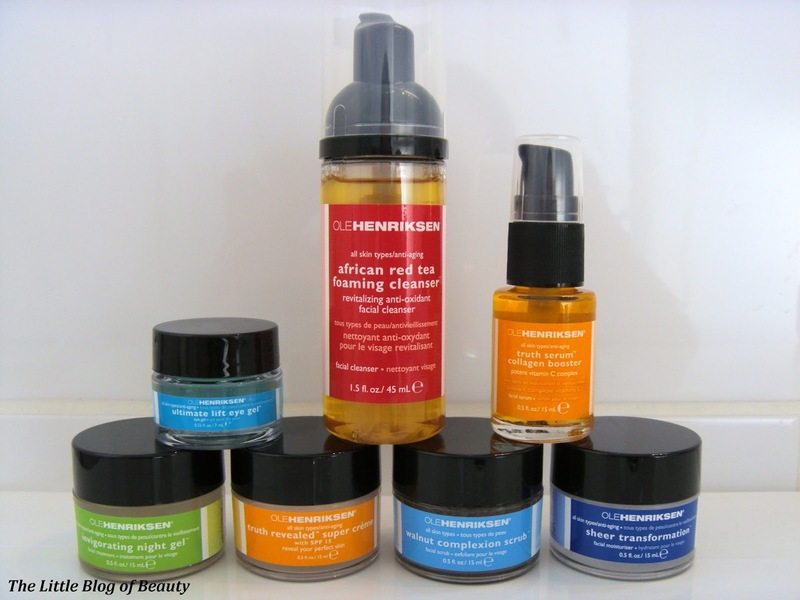 I've only tried a sample sachet of one of Ole Henriksen's product before but I loved it. I looked up the product in question and discovered the cost was somewhere around the £50 mark, so I tried to forget about it and faced up to the fact that we would never be together. 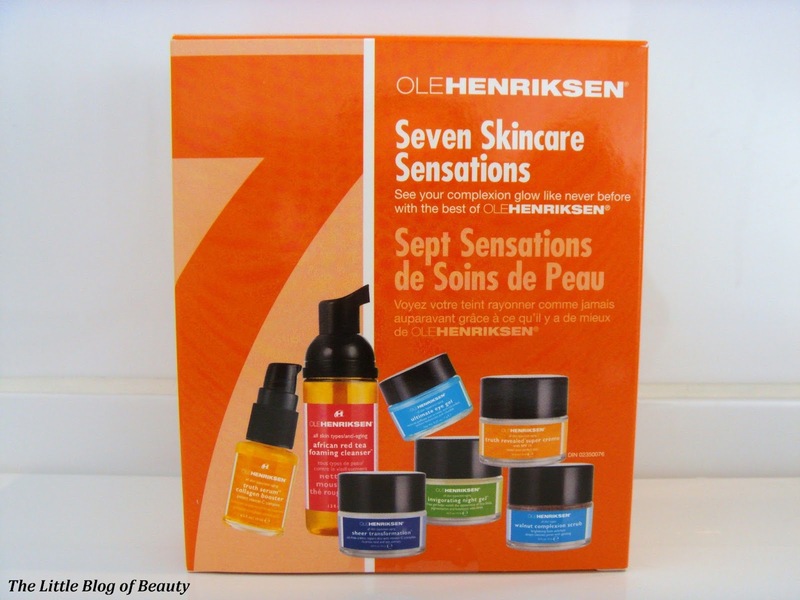 So when I spotted the Seven Skincare Sensations set in the sale for £24 (worth £89 I believe it said) and tried the code and found that it worked I snapped it up. I have a couple of products I'm currently using that I want to finish up before I make a start on these but I thought I'd introduce you to the product now and I'll follow up with my reviews in the future. I love that the side of the box tells you which products you should use when and in what order (otherwise I wouldn't actually be sure which to use when) and I intend on using all of the products together to see what a very expensive skincare regime might be able to do for my skin. This is step 1 for both your morning and evening routine. This is sulphate-free, paraben-free and contains naturally antioxidant-rich African red tea and Vitamin C. This is non-drying and gentle enough for sensitive skin but strong enough to remove makeup. This isn't the product I tried previously but this had caught my eye and I wanted to try it. This is step 2 of your morning routine and should be applied after cleansing. As with the red tea cleanser this is sulphate-free and paraben-free (as are each of the products so I won't mention this point again). This contains Vitamin C to calm, heal and strengthen collagen and Vitamin E to heal, restore and nourish. It also contains Grapefruit and Orange extract to purify and brighten, Green tea to protect against damage, Rosehip to repair and strengthen and Sodium hyaluronate to bind moisture to the skin. I'm hoping this one is as good as it sounds, although maybe not too much as I don't think I'll be able to part with nearly £50 for a full sized one. This is the product that I've previously tried a sample of and loved. This is the 3rd and final step of your morning routine and is applied over the Truth serum. This contains SPF 15 and a little note on the Ole Henriksen website informs you that the Skin Cancer Foundation recommend this product as an effective UV sunscreen. This contains Micro algae to firm skin and boost collagen production and Tripeptide-5 to stimulate collagen to eliminate fine lines and wrinkles. The final featured ingredient I love the sound of. This is called Omega 3 Happiness Concentrate, which improves microcirculation for a radiant complexion and apparently also promotes happiness. I'm not quite sure if this is supposed to mean happy skin or happy you, but wouldn't it be great if you could just apply a cream to make yourself happy! This is the 2nd step of your evening routine following cleansing. This contains Algae extract to nourish the skin with vitamins and minerals and Mucopolysaccharrides (?) to bind moisture to the skin and provide superior hydration. This also contains Alpha hydroxy acid complex to renew skin cells, diminish fine lines and wrinkles smooth texture and balance skin tone. This is also claimed to regulate overactive sebaceous gland to minimise blemishes. 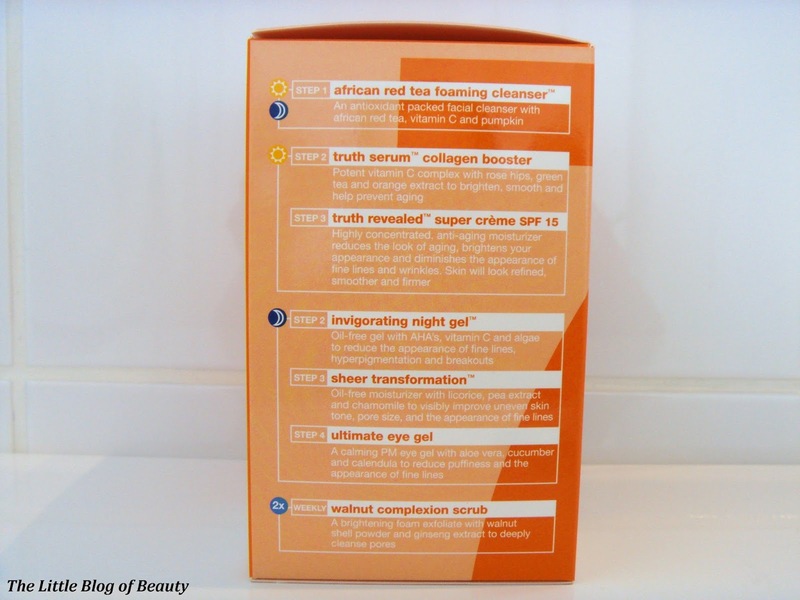 This is the 3rd step of the evening routine, to be applied over the Invigorating night gel. This one contains Vitamin C to stimulate collagen production, Vitamin E to heal, restore and nourish and fruit acids to retexturise and smooth lines. It also contains Sandlewood, Geranium, Licorice and Chamomile to soothe, replenish, balance and purify and something called Actiwhite™, which apparently prevents and corrects discolouration and evens skin tone with a combination of Pea extract and Sugar. Is now a good time to mention I can't stand peas? I'm sure that won't effect me being able to use this product though! This is the 4th and final step of the evening routine following on from the Transformation gel. This contains Calendula extract to energise and soften, Cucumber extract to tighten pores and work as a decongestant, Peptides to improve elasticity and tone and Arginine to promote wrinkle resistance. Finally it contains something called Eyebright extract to calm, soothe and restrict the capillaries around the eye area. This one should be used twice a week in place of the African red tea cleanser. This should be applied to wet skin and massaged in circular motions. This is described as densely textured so I may go carefully with this to begin with as my cheeks in particular are very sensitive and easily aggravated. This contains Aloe vera to moisturise, calm and heal, Chamomile to calm, soften and soothe, Korean ginseng to increase cellular energy and and stimulate microcirculation and finally walnut powder to be mildly abrasive and aid in cell renewal. What is really scary is that if I decided to buy the full size version of each product to continue the same skin care routine it would set me back £281. I can tell you that definitely won't be happening! I am looking forward to giving this a try though and if I do like the products I'll probably pick a couple and see if I can drop hints for some birthday presents. Would you spend this kind of money on a complete skin care routine or maybe treat yourself to one or two products?